Well, I did it. I made the best friggin ice cream on the planet. This Chocolate Olive Oil Ice Cream. But not just any Chocolate Olive Oil Ice Cream… a medicated Chocolate Olive Oil Ice Cream made with just five ingredients! And you make it in a blender too, so you don’t need to buy an ice cream maker to make this (although, I must say, I own an ice cream machine myself and it was definitely one worthwhile investment. I love it and feel like such a pro when I use it 😉). 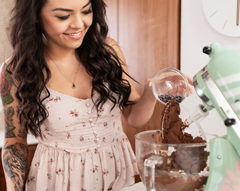 Best of all, it’s refined sugar free and full of healthy fats, with a punch of protein! Way better than pot brownies, amirite? After making my Chocolate Fudge Ice Cream for the third time this last month, I thought I’d make a variation of it. I was thinking a peanut butter swirl, or maybe even blending in some bananas. I looked through my pantry and fridge to find some inspiration, and that’s when I saw it — my cannabis-infused olive oil. When it comes to making homemade marijuana edibles, I prefer a low-dose of THC. I mean, you get to eat more of it (yassss). Kinda like gummy vitamins. They’re so damn good but when you can only have two, what’s the point? I want to eat like, thirty. But without dying from some vitamin or mineral overdose. It all depends on how you make your marijuana-infused olive oil. You control the potency. My canna oil has a potency of 1mg THC per 1ml of oil. The recipe calls for 5 tsp (or 25ml) of oil, so the entire batch of ice cream has 25mg THC. If you’ve read my CBD-Infused Butter Mints post, then you know I use CBD for stress, anxiety, and sleep. This recipe calls for just 3 tablespoons of honey, so I used my favorite CBD-infused honey in this ice cream. I have the 500mg jar, so the entire batch of ice cream also has 252mg CBD. 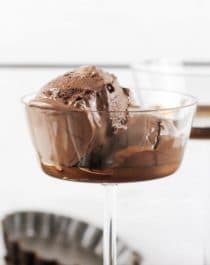 This five ingredient Dark Chocolate Olive Oil Ice Cream is ultra creamy, rich, and perfectly sweet. Made healthy and no ice cream maker required! In a blender (I used my NutriBullet), add the almond milk, protein powder, honey, and olive oil. Blend until completely smooth. Add the melted chocolate and blend again. Pour the mixture into a large bowl and place in the fridge for 1 hour. Transfer to the freezer for ~4 hours, or until scoopable. Serve with mini chocolate chips and some flaked sea salt. Maybe a joint too. Regular olive oil works too if you don't want/have infused EVOO! If you’ve ever wondered how to make homemade cannabis edibles that aren’t cliché like pot brownies and gummy worms, then this Medicated Chocolate Olive Oil Ice Cream recipe is for YOU! It’s ultra creamy, incredibly rich, and perfectly sweet. Plus, it’s made with just five ingredients, and no ice cream machine required. For sure it looks amazing! I have to taste it! Love how healthy it sounds, no sugar and good fat! Chocolate and Olive Oil Are The Perfect Pair for a Heart-Healthy . Thanks. Would a sugar free maple syrup such as lakanto (monk fruit) Work in place of honey perhaps? With maybe some stevia drops to offset the sweetness lost? Hope you like the ice cream!! Jessica, I’m assuming you CAN use an ice cream maker? 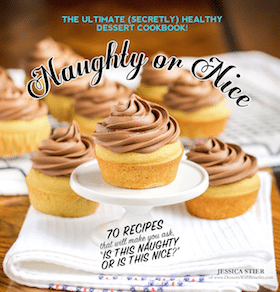 Jessica, I’m excited to try this recipe. My family LOVES ice cream, but we save it for a 1x week treat. It would be so fun to wow them with a healthy version that tastes good! Did I miss the nutrition facts on this, or did you not include them? Hi Tresa! I try to make the nutrition label for all my recipes but it takes a lot of time so sometimes I skip it in a time crunch. The “calculators” out there are rarely accurate so I always do it myself from scratch. Feel free to make one though! 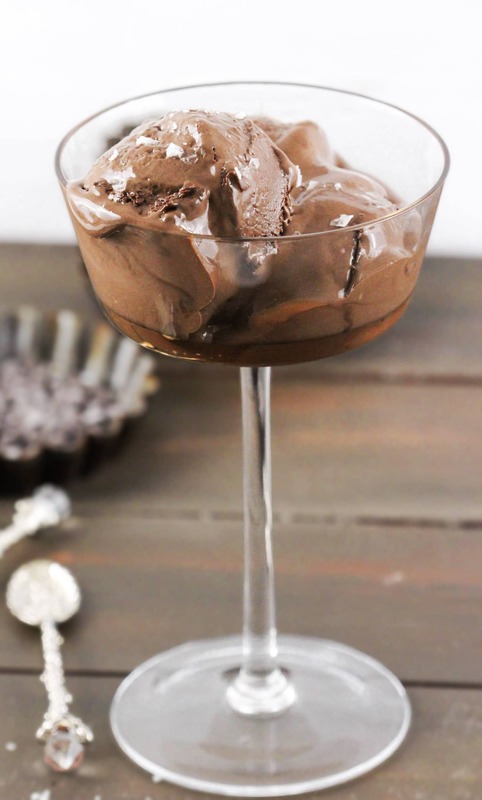 This ice cream is definitely a decadent one, not low fat or sugar free like my other ice cream recipes. But it’s still healthy 😉 especially in comparison to store-bought ones! 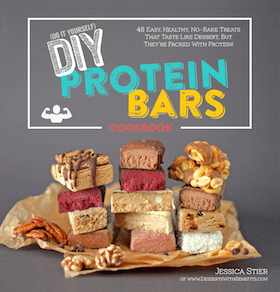 Will this still work with a plant based protein instead of whey?